Z.P.E. Zero Pollution Energy is the new revolutionary and patent-pending Aluminium heating system entirely developed by Presezzi Extrusion. The Z.P.E. is a magnetic induction furnace suitable for aluminum alloy or non-ferrous material billets. Thanks to its low energy consumption equal to 160 kWh/Ton*. The Z.P.E. allows an saving up to 39% when compared to the best alternative induction heating systems available. 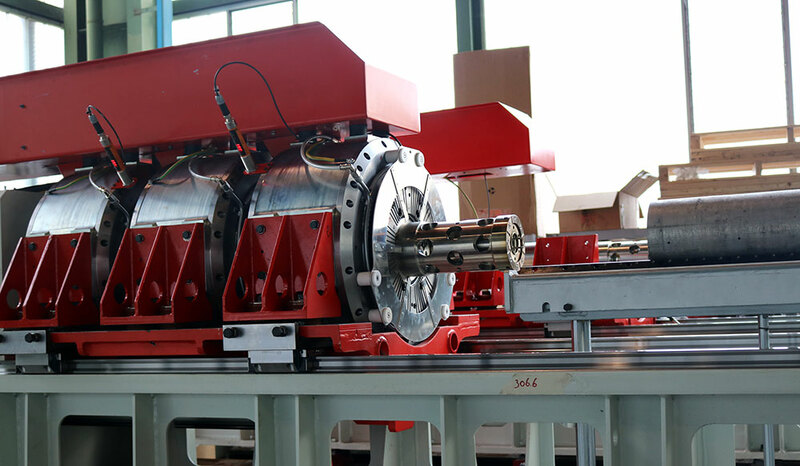 The heating of the billet is obtained thanks to the magnetic field that is created during the rotation of the permanent magnets, assembled inside the rotor of a coaxial motor. The force lines that are created by the magnetic field penetrate deeply into the material, thereby obtaining the heating effect. According to the maximum length of the billet, the solution provides the use of different sectors or zones, in order to cover the entire length of the billet. Thanks to the independent heating sections of the Z.P.E. which are controlled by a frequency converter, simply acting on the rotation speed of each sector it is possible to obtain different temperature results in the same cycle time. The Z.P.E. makes an accurate calculation and control of the heating process taking into account the type of alloy and the starting temperature. It automatically calculates the exact processing time and speed with real-time adjustment to obtain the desired temperature. When the billet is loaded into the furnace it is blocked between a mechanical support, which will be the reference point, and a movable stop which adapts its position according to the billet length. When the billet is locked, the furnace moves along to cover the length of the billet and then the heating starts. The furnace moves horizontally and is actuated by a linear actuator provided with electric servomotor. Energy Saving up to 39% thanks to the low energy consumption. Only 165 KWH / Ton.